As many of you know, at age 18 Jasen was diagnosed with kidney disease. 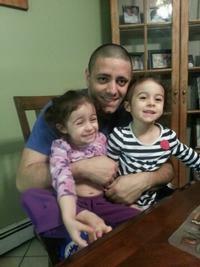 Now 32 and the proud father of three-year-old twin daughters, he is in end-stage renal failure. He has been informed by his doctor’s that his only hope for a healthy life is to have a kidney transplant. He has been evaluated and found to be an excellent candidate for transplant. The very good news is that his wonderful sister has been found to be a match — she will be giving Jasen his Gift of Life on March 26. Transplantation is life-saving but very expensive. Even with insurance, Jasen will have many uninsured transplant-related expenses such as: co-pays and deductibles, doctor visits, travel to and from Mount Sinai Medical Center in NYC and the costly immunosuppressant medications that he will need to take for the rest of his life. This presents a financial challenge that neither Jasen nor his family can meet alone. To help with this financial burden, a fundraising campaign in Jasen’s honor has been established with HelpHOPELive, a nonprofit organization that has been assisting the transplant community for 30 years. All donations are tax-deductible, are held by HelpHOPELive in the New York Kidney Transplant Fund, and are administered by HelpHOPELive for transplant-related expenses only. Your contribution is greatly appreciated.For more information, please contact HelpHOPELive at 800.642.8399. At times like this, the help of family, friends and the community is crucial to help ensure a successful outcome. Your financial gifts and prayers are greatly appreciated and can make a difference. Maybe you don't remember me. I'am Tito ,Maggie brother . I hope you feel better.i pray for you. And remember Jesus love you. Your like a son to me! Prayers are with you and your sister and am sure you have a healthy future ahead of you.